The RapiCast 0708 gel electrophoresis system is sized perfectly for rapid analysis of small analytes like PCR and Restriction Enzyme fragments. 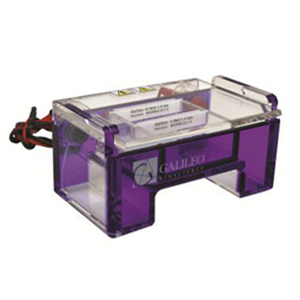 It features a RapidCast gasketed tray for quick in-unit gel casting. The 0708 mini gel system includes a RapiCast™ gasketed gel tray for convenient gel casting right in the buffer chamber. Gasketed (cast in place) 7cm wide x 8cm long UV-transparent gel tray with built-in fluorescent ruler and 2 comb slots.